Canada pushes past a strong Puerto Rico team 81-66 to advance to the finals of the FIBA U16 Americas Championship. Starting guards, Cashius McNeilly and Shemar Rathan-Mayes showed their leadership throughout. McNeilly finished with a team high 23 points and also grabbing nine boards. He controlled the game from the start and was severely missed when he went to the bench halfway through the first where Puerto Rico started to claw back. Six turnovers stopped Canada’s momentum with the second unit and closed out the quarter with a nervous 17-12 lead. From the start of the second quarter, Canada came out flying. Tough defense led to quick buckets on the other end. The combination of Taryn Todd, McNeilly, Rathan-Mayes and Benjamin Krikke took over and proved how well this team can play. A dominating quarter for Canada put this game out of reach at halftime up 46-29. Even with strong pushes from Puerto Rico to try and get back in the game in the second half, Canada would not break. McNeilly took it upon himself to step up and close the game out using his ability to attack the rim at will. Canada’s defense proved to be the difference holding Puerto Rico team averaging 81 points per game to only 66 on 39% shooting and one made three. With this win, Canada advances to the finals for the fourth straight year and will play the winner of USA vs Argentina. The Cadets will be looking to end nearly a decade run of USA dominance. The FIBA U16 Americas Championship final tips off tomorrow (June 18) at 8:00 PM. 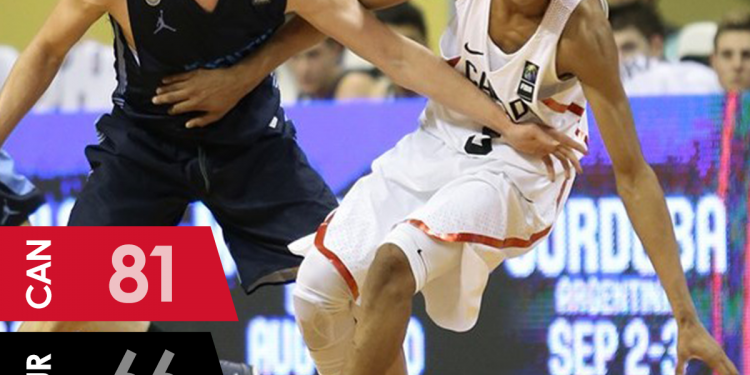 FIBA U-17 World Cup: Can Canada Make it Back to the Semis?